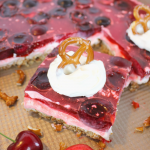 An amazing Jell-o Pretzel Salad Recipe! 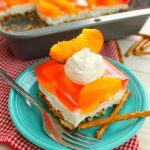 If you love the classic strawberry version, then this peach pretzel salad recipe is right up your alley! Made with a salty-sweet pretzel crust, a delicious cream cheese filling, and an amazing layer of peaches this jello pretzel salad is perfect for your next potluck, cookout or picnic. My family and I recently got back from our annual trip back to South Dakota. We travel back every summer to see family, enjoy some ball games, time on the Missouri river and lots of golf. Inevitably we always enjoy lots of delicious food, typically at potluck get-togethers and family picnics. 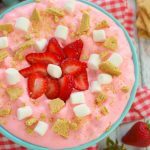 This fantastic jell-o pretzel salad is one of those delicious dishes that’s perfect for any summer meal. This simple crust is made with just a few simple ingredients, and renders a wonderfully salty-sweet base to this salad. You’ll start by crushing pretzel sticks, and combining with granulated sugar and melted butter. Press into the bottom of a 9×13″ pan, and bake for 10 minutes to set. Cool at room temperature. While the crust is cooling, you’ll then create this delicious, fluffy cream cheese layer. With a hand or stand mixer, you’ll mix together cream cheese, granulated sugar, and thawed whipped topping. Evenly spread the cream cheese mixture over the top of the cooled crust. Important Note: Make sure to seal the filling all the way to the edges of the pan. This will create a seal for the jell-o that will go on top later, and also prevent the crust from getting soggy. Refrigerate the the cream cheese layer for about 30 minutes to set. 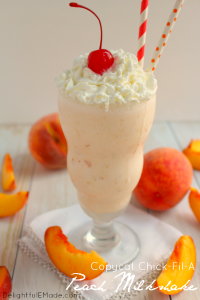 I recommend using fresh peaches, however, if fresh peaches aren’t in season, feel free to use frozen or canned peaches. I really think the flavor of fresh peaches is second to none, and is a wonderful way to this fantastic summer produce. 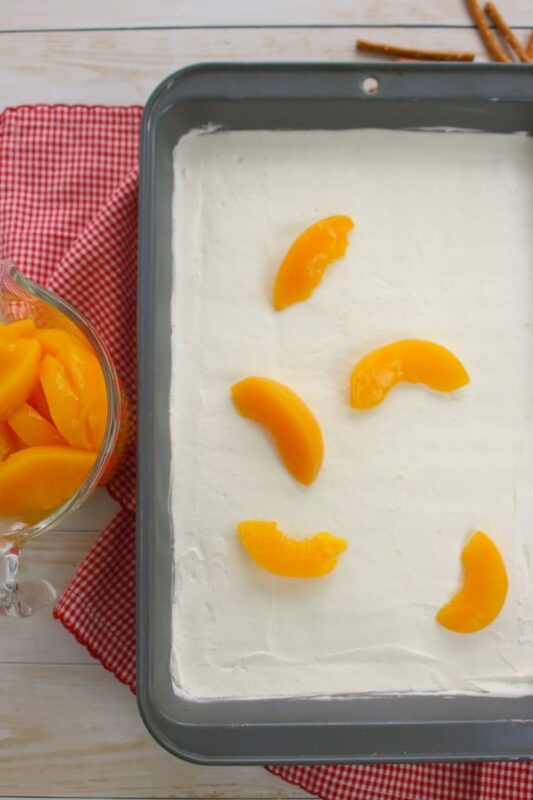 Be sure to layer the peaches evenly over the top of the cream cheese filling. 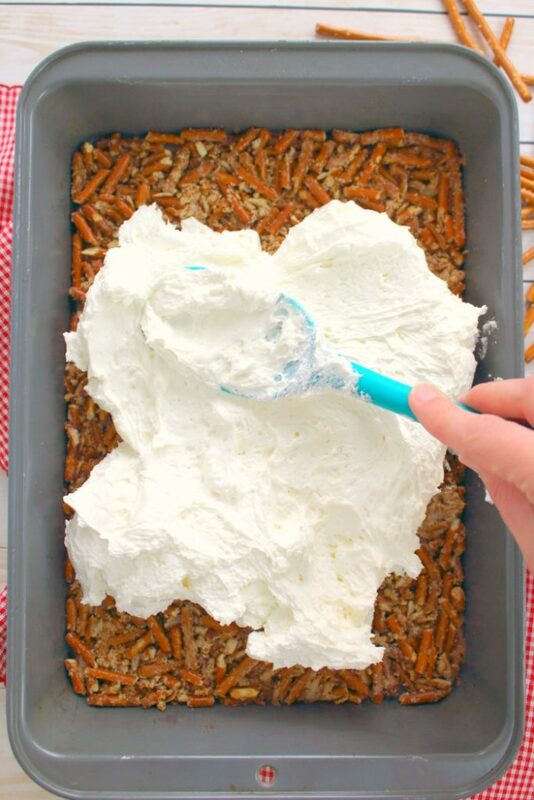 This will ensure that every slice of this pretzel salad gets plenty of fruit. 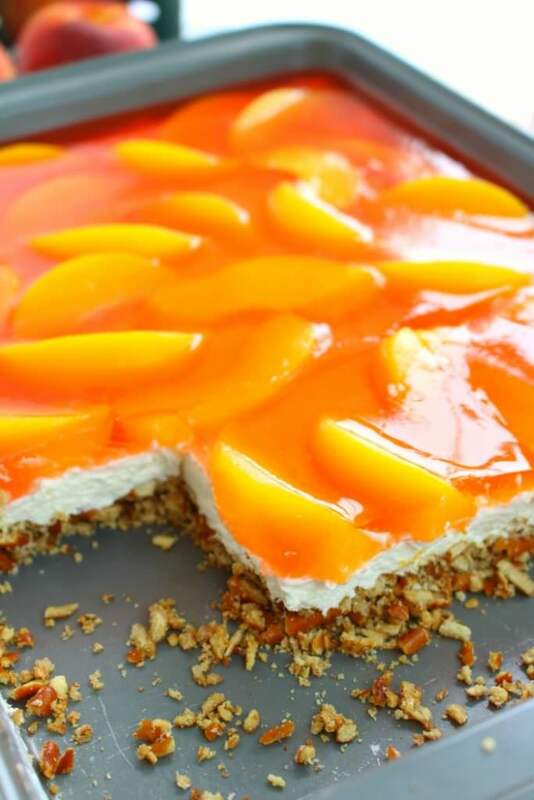 Once you’ve placed the peaches over the top of the cream cheese filling, you’ll then top the peaches with the peach jell-o. Note that in the recipe (below) you’ll begin making this recipe by FIRST boiling the water and dissolving the jell-o mix. The jell-o will then cool to room temperature, as you are making the other layers of this salad. If you forget to boil water and make the jell-o, no worries. Just refrigerate the pan until the jell-o has cooled to room temperature. 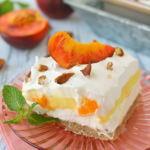 Once you’ve added the jell-o to the peaches, refrigerate the salad for at least 1-2 hours or until the jell-o has set completely. Once the jell-o has set, you’ll have the most fantastic summer time treat! 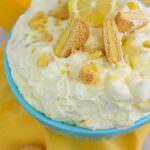 Serve this as a side dish or a wonderful summer dessert. 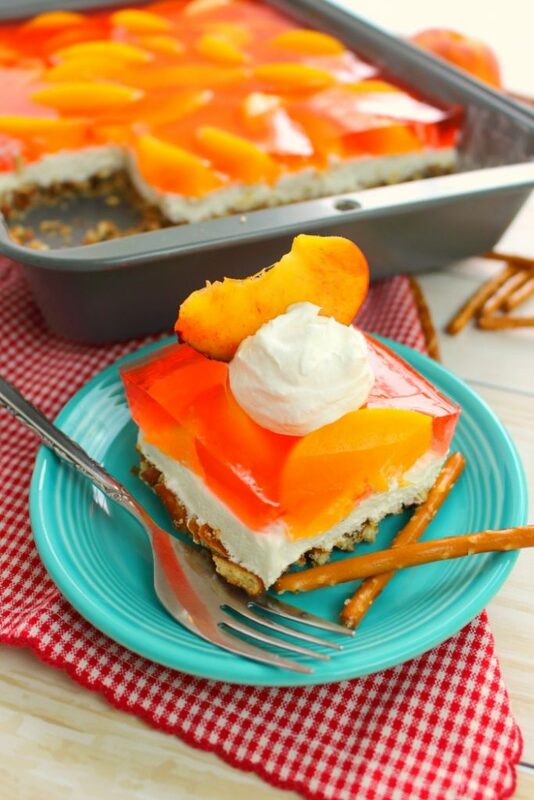 Any way you have it, this fantastic pretzel salad is a great way to enjoy the most amazing summer peaches! Preheat the oven to 350 degrees. 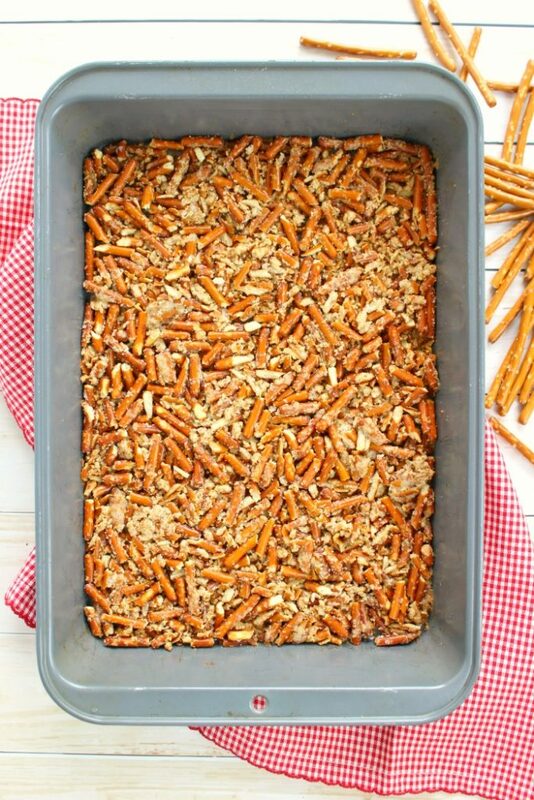 In a 9x13" pan, add the pretzels, sugar and melted butter. Stir together to coat, and then evenly press into the bottom of the pan. Bake the crust for 10 minutes. Remove from oven and let cool completely. While crust is baking, empty jell-o into a bowl, and add boiling water. Stir to disolve. Set jell-o aside to cool to room temperature. With a hand or stand mixer, cream together the cream cheese and sugar until fluffy and smooth. Gradually add in the whipping topping and mix until completely combined. Spread mixture evenly over the cooled crust, making sure filling is sealed to the sides of the pan. (This is important, as you don't wait the jell-o liquid to leak to the bottom of the crust making it soggy.) Refrigerate crust and cream cheese mixture for 30 minutes to set. 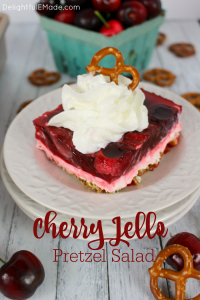 While crust and filling layers are chilling, slice and pit the fresh cherries and add to the cooled jell-o liquid. 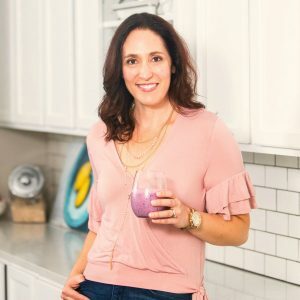 When the 30 minutes is up, pour the cherries & jell-o over the cream cheese layer, and chill for at least 1-2 hours or until jell-o is completely set. Garnish with whipped cream and additional pretzels, if desired. Slice into squares and enjoy! Preheat the oven to 350 degrees. In a 9x13" pan, add the pretzels, sugar and melted butter. Stir together to coat, and then evenly press into the bottom of the pan. Bake the crust for 10 minutes. Remove from oven and let cool completely. While crust is baking, empty jell-o mix into a bowl, and add boiling water. Stir to dissolve. Set jell-o aside to cool to room temperature. With a hand or stand mixer, cream together the cream cheese and sugar until fluffy and smooth. Gradually add in the whipping topping and mix until completely combined. Spread mixture evenly over the cooled crust, making sure filling is sealed to the sides of the pan. (This is important, as you don't wait the jell-o liquid to leak to the bottom of the crust making it soggy.) Refrigerate crust and cream cheese mixture for 30 minutes to set. 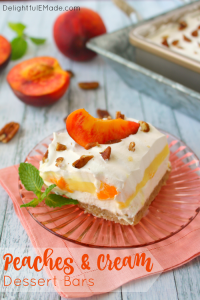 While crust and filling layers are chilling, slice and peel the fresh peaches. 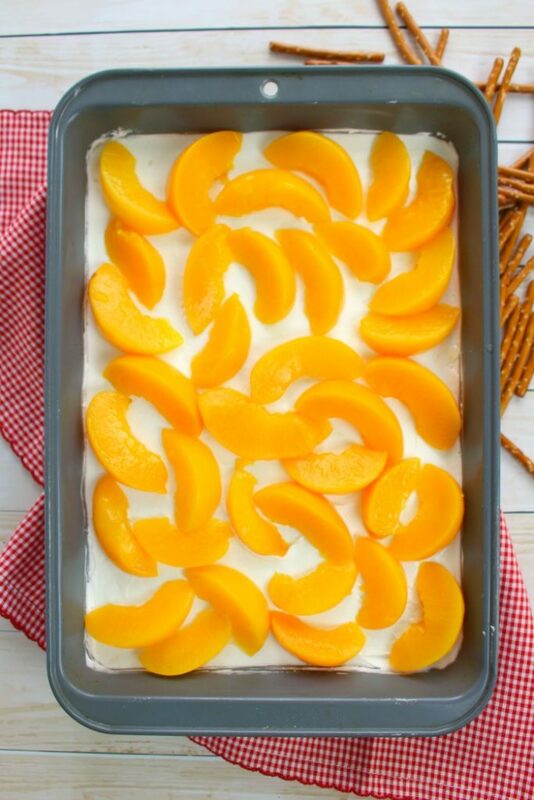 Once the cream cheese layer is cool, add the peach slices. 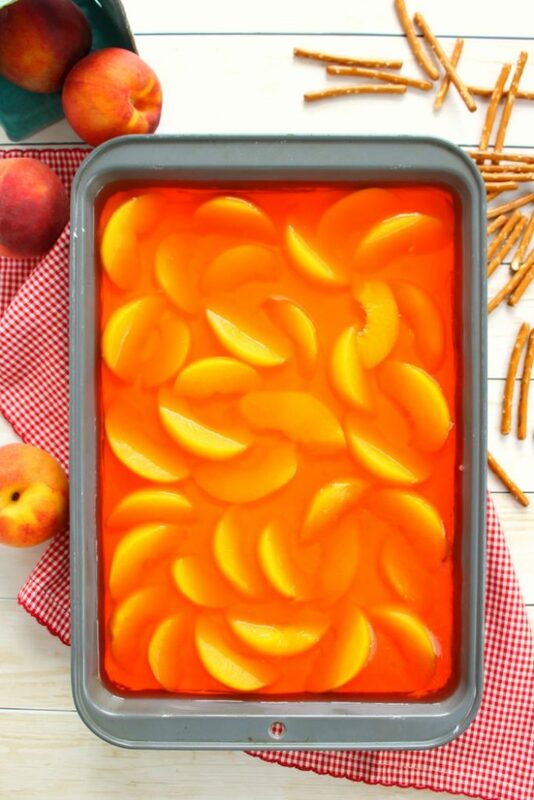 Pour the room temperature jell-o over the peaches. Chill for at least 1-2 hours or until jell-o is completely set. Garnish with whipped cream and additional pretzels, if desired. Slice into squares and enjoy! 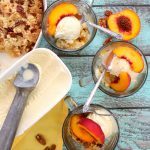 If fresh peaches are out of season,feel free to use canned or frozen peaches. 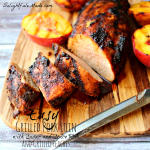 I love salty sweet - Thanks for sharing at the What's for Dinner link party!